365 Fashion and Lifestyle: PARIS Fashion Week. F/W 2012-2013. Episode 3: POWERful WOMEN. PARIS Fashion Week. F/W 2012-2013. Episode 3: POWERful WOMEN. Men fear them but, designers certainly love them. PFW is no stranger to these ladies. 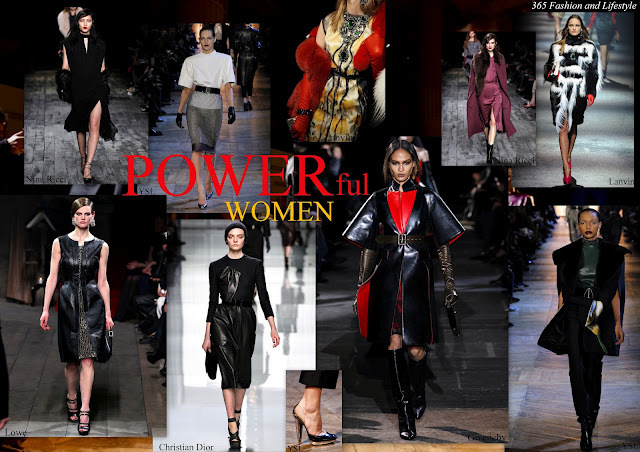 Devoted consumers of high fashion, never low on budget, players that seem to follow only their own rules, powerful women are never forgotten by the designers who choose this city to reveal their new collections. They offered them fur,draped silk dresses and bonkers-brilliant jewels, leather, turtleneck dresses, belts and amazing high boots, versatile jackets, high heels and glossily black leather. Hmmm... Feels good to be a powerful women.